Greatful to have a medical specialist that listens & problem solves with me so I can better understand my disease. Ifeel hopeful after appt knowing that treatment is providing a better quality to my life. Greatful to have a medical specialist that listens & problem solves with me so I can better understand my disease. I feel hopeful after appt knowing that treatment is providing abetter quality to my life. *** This clinic does not accept self-pay patients. *** Tamar Polonsky, MD, MSCI, is a general cardiologist. She treats a wide range of cardiac conditions, including coronary artery disease, hypertension, hyperlipidemia (high cholesterol), and valve disease. Dr. Polonsky also specializes in the management of heart disease in cancer patients. She works closely with oncologists and surgeons to take care of patients with preexisting heart disease and to help monitor for potential cardiac complications from chemotherapy and radiation. 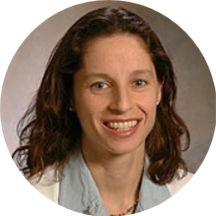 Dr. Polonsky has research expertise in cardiovascular epidemiology and prevention. She has experience analyzing data from large cohort studies, with the aim of finding novel ways to predict a person's risk of developing heart disease. In order to best serve you, please remember to provide your unique member ID number on your insurance card for your appointment. If this is not provided, you may expect a call from our office to get that information prior to your appointment so we can verify your benefits. We look forward to seeing you. The Doctor was very thorough in explaining my health issues. I had a nice visit. The visit was smooth and informative, good and right to the point. I had a great visit.